This little unassuming restaurant in a strip mall by Richmond Square Center blew us away the other night. I chose to eat there because it had ample parking close to the restaurant (I’m currently on crutches). I’m so glad I did, because the food was absolutely delicious. 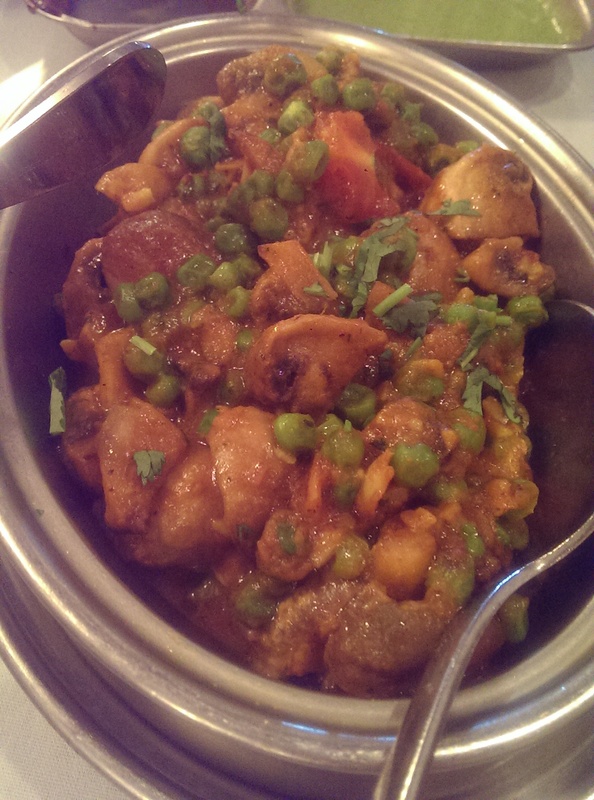 They serve both south and north Indian dishes, and there are lots of choices (both veg and non-veg) to choose from. We started out ordering some appetizers. My friends ordered the Vegetarian Platter, which features samosa and potato, cauliflower and eggplant pakoras. I jokingly referred to it as the big plate of fried stuff. Well, they certainly fry things well. 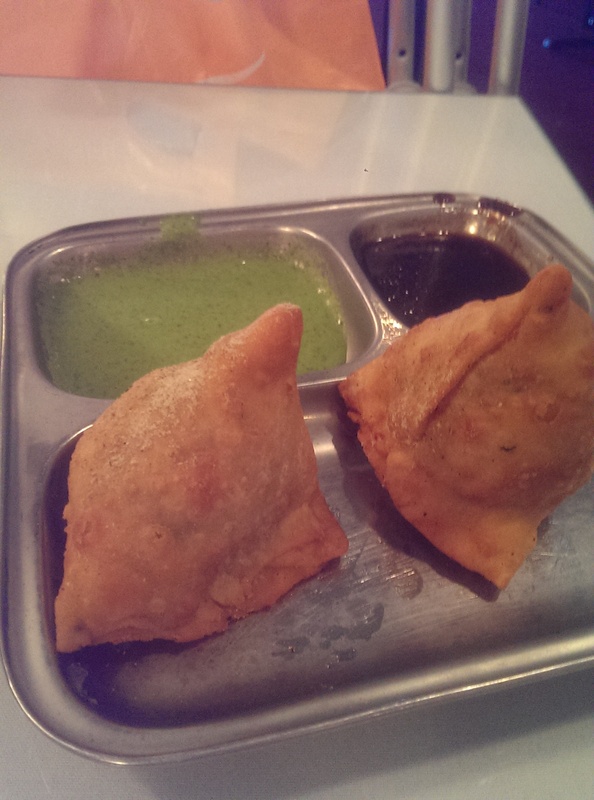 My friends raved about the vegetable samosa, so I ended up ordering a serving and eating one and taking one home. They also let me try a pakora, and it was lightly fried and not at all greasy. It had a crisp exterior and a light and fluffy interior. 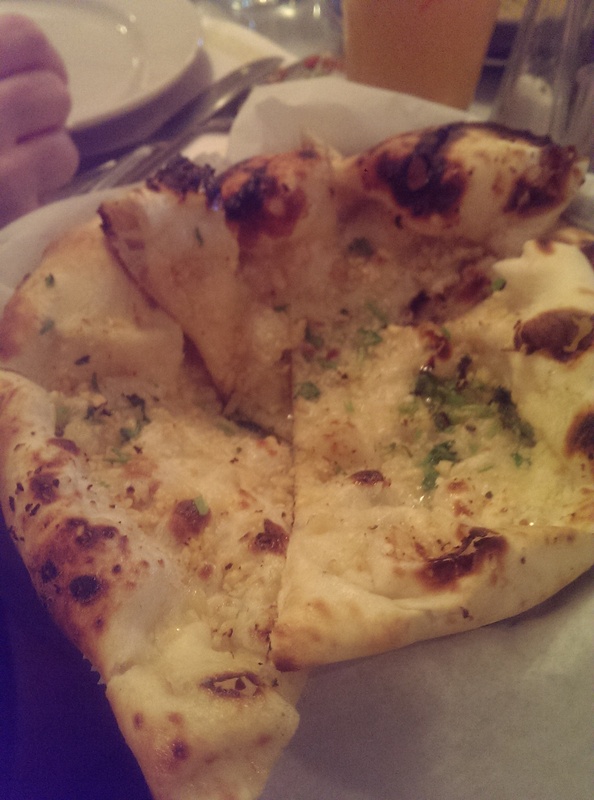 I ordered the Garlic Naan, and my friend’s husband ordered the Peshwari Naan. He enjoyed it, but I can’t say anything about it since I didn’t try it. I was all about my Garlic Naan. The bread was fried light and thin and was very garlicky. I went home reeking of garlic and had plenty left over for the next day. While looking at the menu online I noticed they had my favorite, Chicken Saag, on the menu, so I knew what I would be ordering. 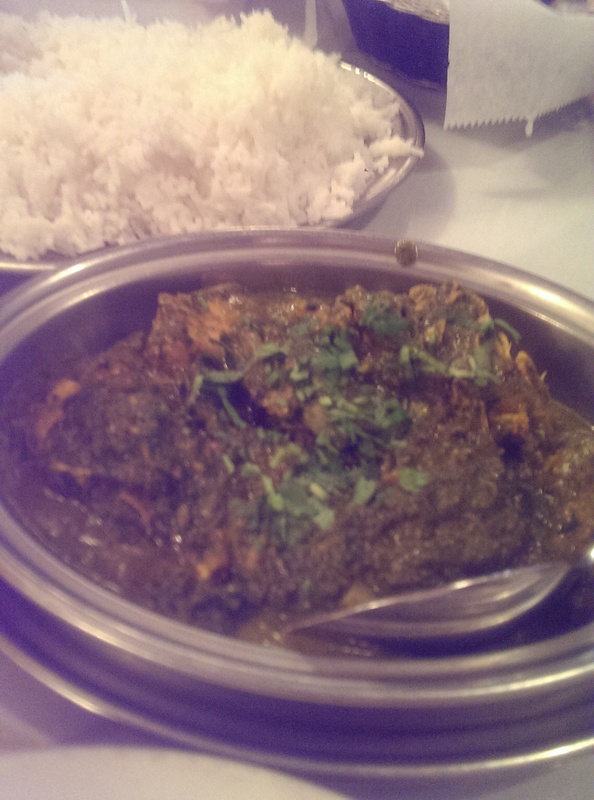 I liked the saag, which is chicken cooked with spinach. It was billed as medium hot, but there was no spice to it at all. I think I will ask for them to bring it up one notch next time. It was kind of bland and boring without any spice. However, I was also in the mood for a mushroom dish and was dining with some friends who are vegetarians, so I decided to also order the Peas and Mushrooms, which are fresh peas and mushrooms in a “mildly spiced creamy sauce.” I am so glad I did, because this particular dish was mouthwateringly good even without the spice. My friend kept sneaking spoonfuls of it because she liked it as well. In return, I was able to get a bite of her Bombay Potatoes and try the sauce from her husband’s Malai Kotta (which was slightly sweet and very creamy). We were hell bent on leftovers, so my friend also ordered the Masala Dosa. Honestly I have never been a fan of dosa. I have several friends who are crazy for them so I’ve had them before at several places. I have found the crepe to be somewhat dry and the filling quite meager in the Indian restaurants that serve them here. 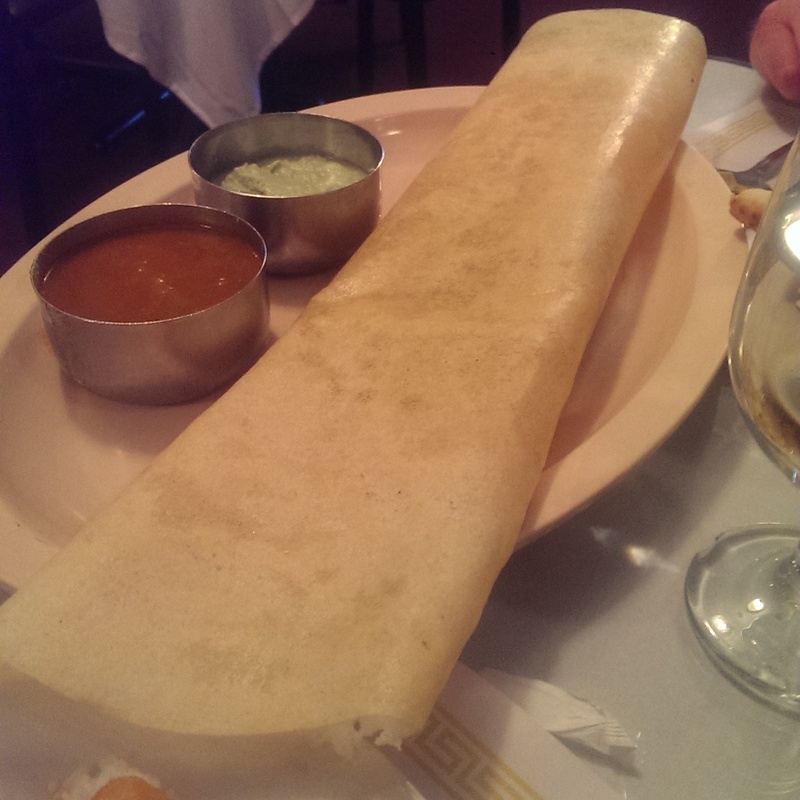 I now understand the love for Masala Dosa, because this dosa was so delicious. The potato and onion filling was plentiful and extended almost all the way through the dosa. The filling was also extremely buttery in flavor, with the onion almost carmelized and sweet. The bite I had was moist and delicious, and I was thrilled to learn they serve them along with the lunch buffet. I don’t know what spices they use, but everything was extremely delicious. 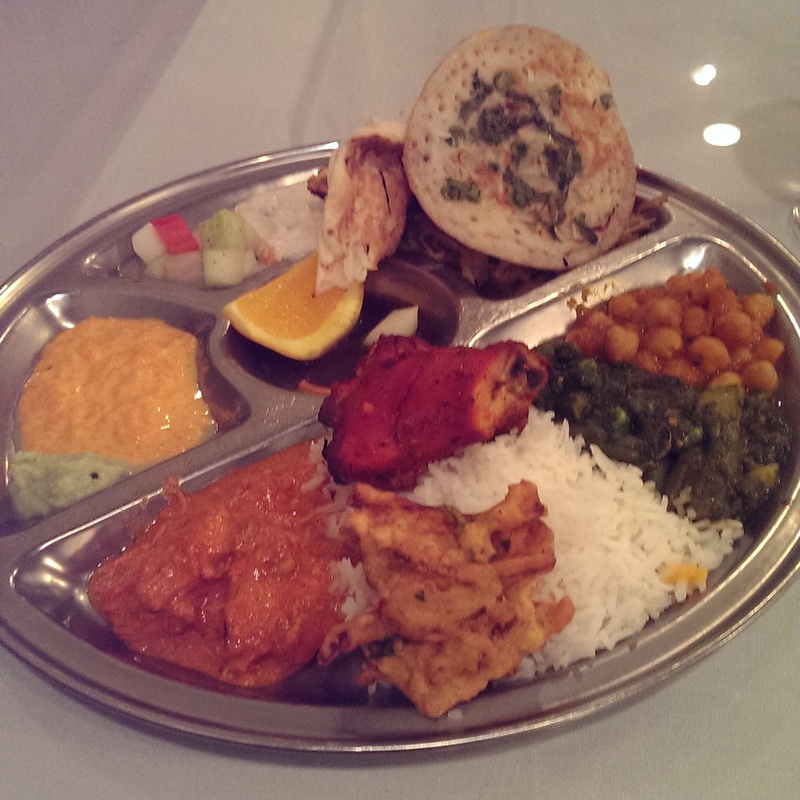 My friends, who love Indian food, were extremely impressed with the place, and so was I. I was so excited about the leftovers that I ended up eating them for breakfast the next day and enjoyed every single bite. They also offer a lunch buffet for $8.99, which I went back for several days later. The lunch buffet on the day I went there included tandoori chicken, butter chicken, a peas and saag dish, chana masala, utthapam (the pancake-looking bread), a cabbage dish (hidden under the utthapam and naan) that I very much enjoyed, naan, rice, some yogurt-based salads, a delicious rice pudding (kheer) and several other options. They also have a Grand Buffet for $10.99 on the weekend. So if you are on the east side and are looking for some good Indian food, definitely be sure to check this place out!